Reveal a radiant complexion with the Detoxifying Cleansing Set from Erno Laszlo, a duo of skincare treatments expertly formulated with advanced technologies, antioxidants and essential vitamins to create a bespoke regime. When combined, the cleansing oil and bar create a purifying mask that effectively sweeps away dirt, oil and impurities from pores. Suitable for daily use, you can expect transformed skin with a restored vitality and healthy-looking radiance. Lightweight and non-greasy, the cleanser is fortified with the active ingredient Charcoal, which works to draw out dirt, oil and impurities from pores like a magnet, visibly reducing their size. Enriched with anti-inflammatory Algae Extract, it stimulates cell renewal and eliminates everyday toxins that are prevalent in cities and traffic-congested areas that cause skin to look dull and lacklustre. Upon application, the oil transforms from black to white and aims to reveal a brighter, healthier-looking complexion. Perfect for stressed out and irritated skin, the soap bar boasts the therapeutic benefits of Dead Sea Mud, which is brimming with minerals to deeply detoxify, exfoliate and moisturize. Glycerin acts as a powerful magnet for hydration and seals it in to ensure optimum moisture levels, whilst Palm and Palm Kernel Oils stimulate cell regeneration and the fatty acids help to balance your complexion by mimicking the same nourishing oils and pH balance found in skin already. The Transphuse Eye Refiner works to relax and replenish the muscles around the eye area. Using Gatuline Expression for a smoother appearance and Glycosaminoglycans and Matrixyl 3000 to boost collagen production for a plumper look, this rich cream is a must have. Innovative polypeptide technology restores the skin at a cellular level whilst Algae and Pullulan extracts provide an immediate tightening effect. Gently apply a generous amount in small circular motions on dry skin. Massage over face and jawline to open pores and trap dirt and makeup on the face. Follow with the Sea Mud Deep Cleansing Bar to complete your bespoke Double Cleanse Ritual, for clear, balanced skin. Cleansing Oil: Water (Aqua/Eau), Disodium Laureth Sulfosuccinate, Butylene Glycol, Polysorbate 20, Acrylates/C10-30 Alkyl Acrylate Crosspolymer, Butyrospermum Parkii (Shea) Seedcake Extract, Sodium Lauryl Sulfoacetate, Disodium Cocoamphodiacetate, Simmondsia Chinensis (Jojoba) Seed Oil, Olea Europaea (Olive) Fruit Oil, Vitis Vinifera (Grape) Seed Oil, Sea Water (Maris Aqua/Eau De Mer), Tocopheryl Acetate, Charcoal Powder, Disodium Edta, Sodium Hydroxide, Hexylene Glycol, Caprylyl Glycol, Phenoxyethanol, Chlorphenesin, Parfum (Fragrance). Cleansing Bar: Sodium Palmate, Sodium Palm Kernelate, Water (Aqua/Eau), Silt (Dead Sea Mud), Charcoal Powder, Parfum (Fragrance), Sodium Chloride, Glycerin, Tetrasodium Edta, Tetrasodium Etidronate, Evernia Prunastri (Oakmoss) Extract, Benzyl Cinnamate, Benzyl Benzoate, Ci 77489 (Iron Oxides), Ci 77289 (Chromium Hydroxide Green), Ci 77891 (Titanium Dioxide). Eye Refiner: Water (Aqua/ Eau), Caprylic/Capric Triglycerides, Cyclopentasiloxane, Propylene Glycol, Cetyl Alcohol, Butyrospermum Parkii (Shea Butter), Cetearyl Alcohol, Coco-Glucoside, Persea Gratissima (Avocado) Oil, Olea Europaea (Olive) Fruit Oil, Glycerin, Glycosaminoglycans, Vaccinium Macrocarpon (Cranberry) Seed Oil , Sodium Acrylate/Acryloyldimethyl Taurate Copolymer, Isohexadecane, Palmitoyl Oligopeptide, Palmitoyl Tetrapeptide-7, Bifida Ferment Lysate, Milk Protein (Lactis Proteinum/ Proteine Du Lait), Lactose, Tocopheryl Acetate, Retinyl Palmitate, Algae Extract, Pullulan, Rosmarinus Officinalis (Rosemary) Leaf Extract, Centella Asiatica Extract, Acmella Oleracea Extract, Dimethicone, Carbomer, Hydroxyethylcellulose, Polysorbate 80, Polysorbate 20, Butylene Glycol, Alcohol Denat., Disodium Edta, Phenoxyethanol, Methylparaben, Propylparaben, Butylparaben, Ethylparaben, Isobutylparaben. Removes all make up without drying out your skin. My skin feels super soft every time I use it, I will definitely be re purchasing! Absolutely love this set it really deeply cleanses and removes all traces of makeup without drying out the skin. The oil is the perfect prep for the cleansing bar, a great duo. Would definitely recommend. After only using this product once the results were noticable. My skin is clearer, brighter and overall more healthy. 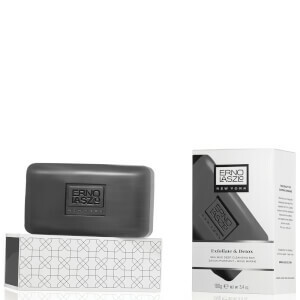 Great value for money and a brilliant introduction into the Erno Laszlo Cleansing routine! I highly recommend you try this. I'm in love with this product! It's really clearing my face up and keep it clear. The smell is very nice and sensations on the skin are very pleasant! I will very recommend this to anyone!!! I LOVE this cleansing set. Being a teenager my skin is always oily and breaking out. I've been using this set for a few months and it has completely cleared my skin. I've been to the dermatologist and they've recommended all sorts of prescriptions and cleansers but nothing has worked like this has. 10/10. I will definitely be buying this again.